For U.S./International orders, please contact us at 1-800-667-8046 x.232 or send us a message. Have you ever been faced with injustice but felt powerless to do anything about it? Changing the political sphere can be difficult. Maybe you think that politicians are too busy to have a conversation, or that your issue is not important enough. Maybe you think you are not knowledgeable enough to speak about a specific concern. But your understanding and insight can make a difference. You do not have to be an expert to get involved. You can effectively voice your concerns about poverty, environmental sustainability, and other public justice issues. We all have a contribution to make. CPJ’s Advocacy Toolkit is designed to help you influence the legislative process. It is a matter of knowing where the access points are, who to contact, and what to say. 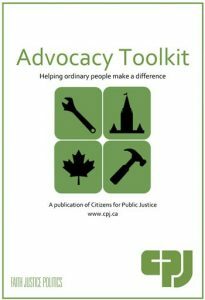 This guide provides tools for people with various levels of ability, with useful information about different methods of advocacy, when to use each, and how to voice concerns most effectively. While we refer mostly to advocacy at the federal level in this Toolkit, the principles and suggestions found inside can be applied to any level of government. Tool — Approaches for active advocacy! Sample — Examples of advocacy tools! Go Deeper — Where to find more information about specific topics! Keep in Mind — Important reminders and tips! Get Creative — Unique ways to advocate for change! Choose a tool you feel comfortable using and begin to act!